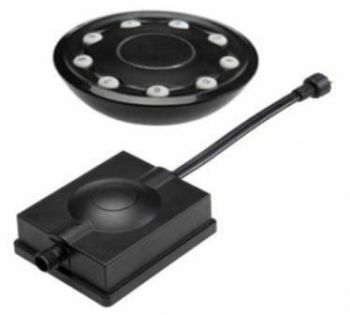 The handheld remote controller is supplied complete with weatherproof Plug & Play remote receiver, which simply connects into any part of the garden or pond lighting circuit via the in-line threaded screw connectors. This innovative device allows on/off control of the lighting circuit at a range of up to 40 metres between Receiver and the supplied hand-held Remote Controller. 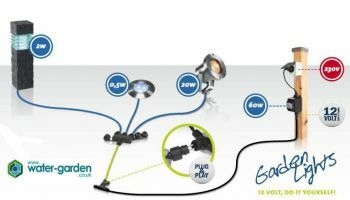 Additional Receivers can be added to the lighting circuit (maximum of 9 Receivers per Remote Controller), allowing individual control of up to 9 lighting 'zones' within the garden landscape, pond or waterfall. 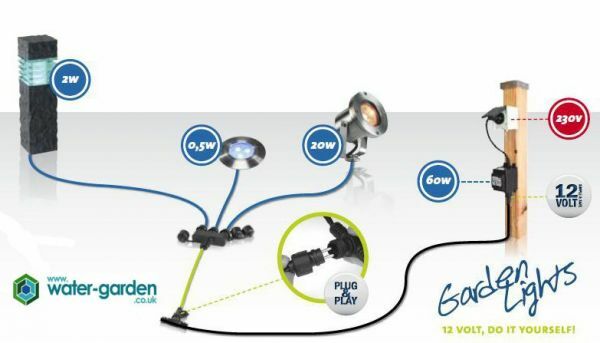 The supplied Receiver is fitted with screw connectors, ready for simple connection to Water Garden's range of low voltage LED Garden and Pond Lights, Extension Cables, Cable Splitters and Transformer components.